On Mark Island along a narrow passage south of Stonington in East Penobscot Bay. Can only be viewed by boat. With a growing fishing industry and booming, prosperous granite quarries in the area, Deer Island Thorofare became a busy waterway in the 19th century. The lighthouse was built in 1857 to help mariners negotiate the waters near Stonington along the western approach to the Thorofare. Keeper Allan Holt was known for his many rescues of stranded boats that landed on Mark Island, which included towing motorboats and stranded lobster boats, and for towing the steamer Minnehah to safety. He is also credited for helping to float the stranded schooner Sarah and Lucy which had run aground an nearby Andrews Island. In February 1935, Keeper Conary had an apparent heart attack and needed to be transported to the mainland. A tugboat was sent out to navigate through the frozen ice flows to bring Conary back to the mainland to the hospital. The tugboat became stuck in Stonington Harbor, leaving no choice but to have Conary transported by lifeboat through the harbor where he survived the ordeal. 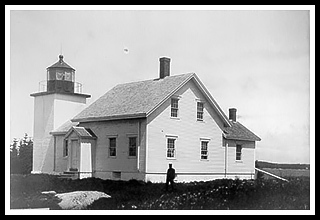 Conary and his wife Gertrude were also known for splitting work between the duties at the lighthouse, and in growing potatoes and canning wild strawberries for their food supply. A unique marital relationship for those days. 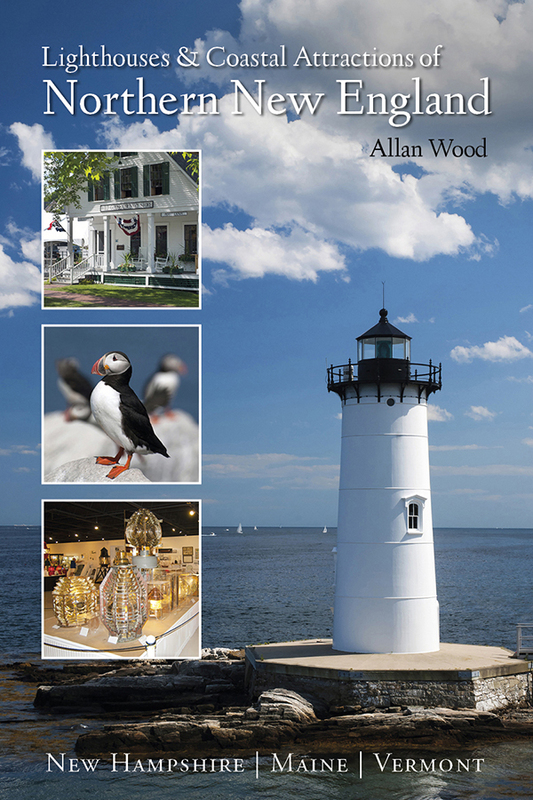 Stonington is known in Maine as one of the most quaint unspoiled fishing villages in Maine. This most beautiful location offers a haven for artists and their galleries, and growing specialty shops. It lies on Deer Isle easily accessible by a bridge from the mainland. The Isle au Haut ferry from the Stonington dock passes by Deer Island Thorofare lighthouse on its lighthouse tour, and at times on route to Isle au Haut. The 100-year old Stonington Opera House provides films, music, and theater year round, including the Deer Isle Jazz Festival in early August. There are three large conservation areas with plenty of trails through mossy forests and along the shoreline maintained by the Island Heritage Trust. These include the Settlement Quarry off Oceanville Road, Crocett Cove Woods off Route 15A, and Holt Mill Pond Reserve off Airport Road. 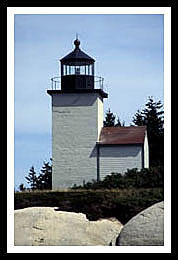 There is also the Lighthouse Trail Weekend sponsored by the Deer Isle Chamber in the middle of September to view up to eight lighthouses in the area; some by land, and others from various boat companies and local business involved in the project. Boat cruises and ferries mentioned below may offer many types of cruises. 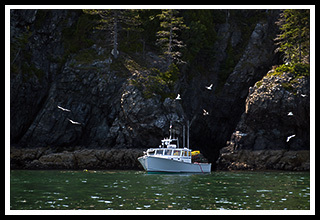 While some may offer specific lighthouse cruises that may pass by Deer Island Thorofare (Mark Island) Lighthouse, some will pass by the light as part of sailing charters, narrated wildlife and historic tours, ferrying passengers, whale watching, fishing tours and other types of excursions. Provides views of the lighthouse and five others on its lighthouse tours, and offers guided kayak tours and rentals out to the many islands just offshore.